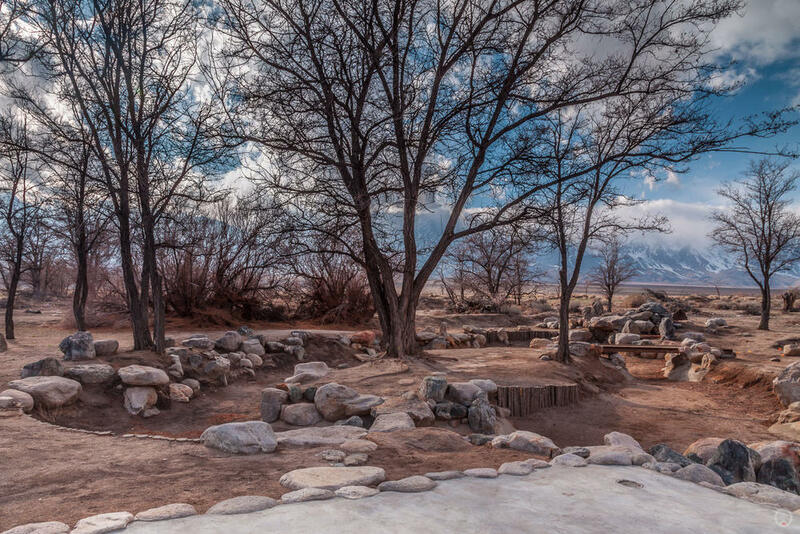 As I wrote in my previous post, I had the opportunity to visit the Manzanar National Historic Site during a vacation I took to Las Vegas and Death Valley in February 2010. 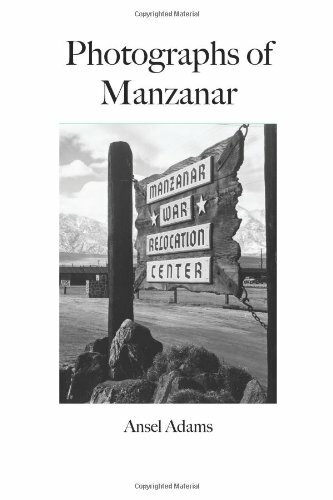 Oddly enough, my awareness of Manzanar came not through anything I learned (or wasn't taught) in school. Nor did it stem from my professional career in architecture. Instead, it came to me via my own personal interest in photography. In this specific case, that of Ansel Adams. 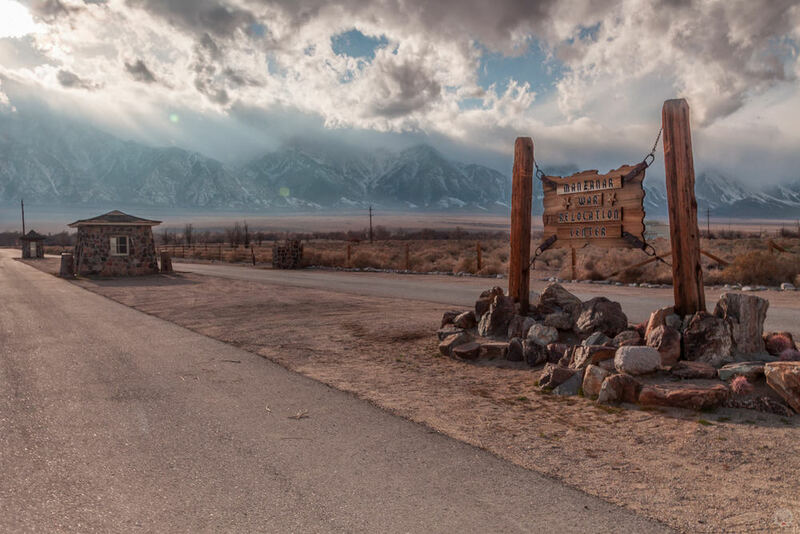 My interest in Ansel's photography led me to the Owens Valley area and ultimately to his work at Manzanar. 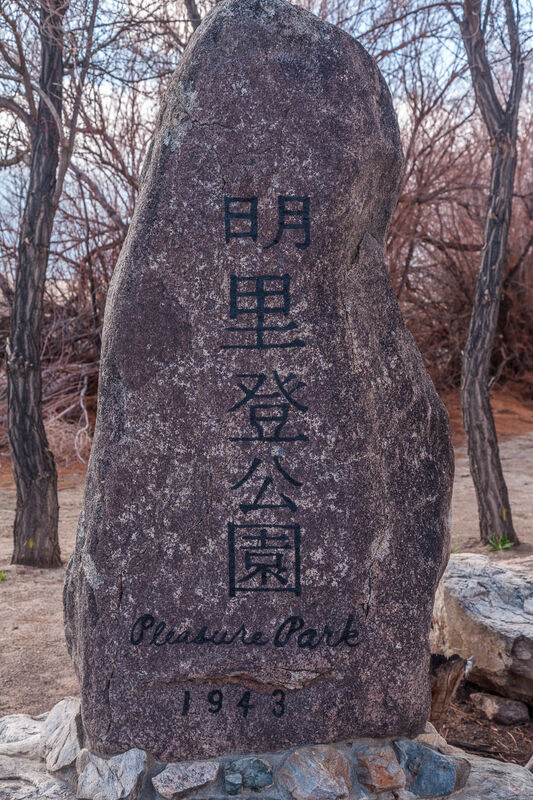 The forced internment of Japanese Americans after the attack on Pearl Harbor distressed Adams personally to the point that he requested permission to visit the Manzanar War Relocation Center and document the conditions with his camera(s). His request was granted with some restrictions. For example, he was not allowed to photograph the guard towers. He cleverly shot around this particular restriction by incorporating their shadows into some of his photographs. His resulting photographs were first shown as a gallery exhibit at the Museum of Modern Art and later published in book form as Born Free and Equal: The Story of Loyal Japanese Americans. 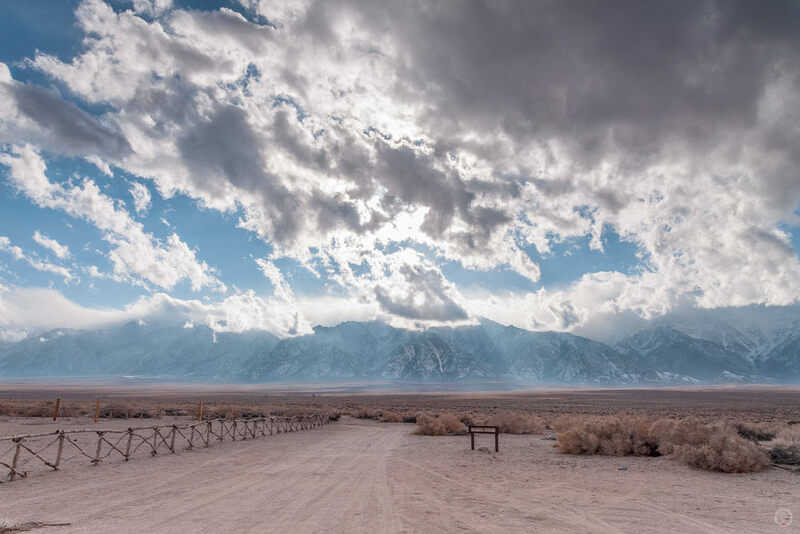 Manzanar is located in the high desert of the Owens Valley at the foot of the Sierra Nevada range. The 14,381 foot peak of Mt. Williamson rises immediately to the west of the site. 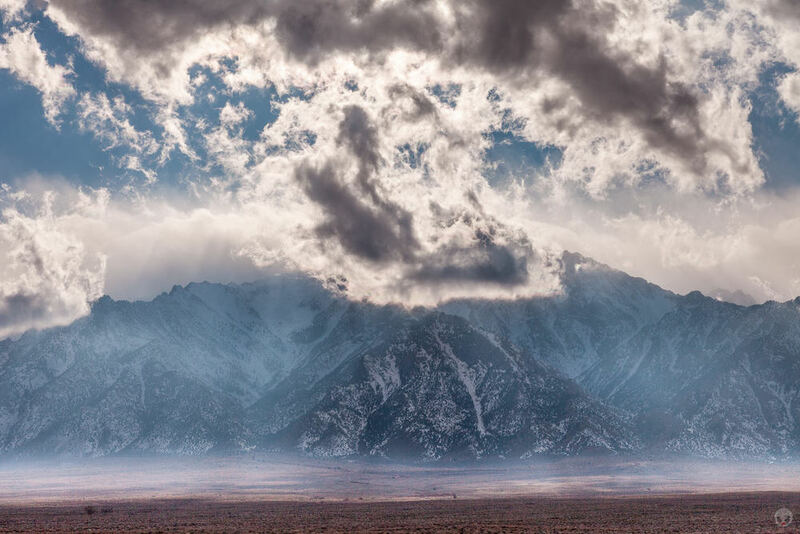 The Inyo Mountain Range rises up in the east. The natural setting has changed little since 1943 when Ansel Adams made his photographs there. However, the built environment has changed dramatically. In the years after the war, most of the 800 structures were demolished or salvaged for other uses in nearby towns. In recent years, some of the historic built environment has returned. 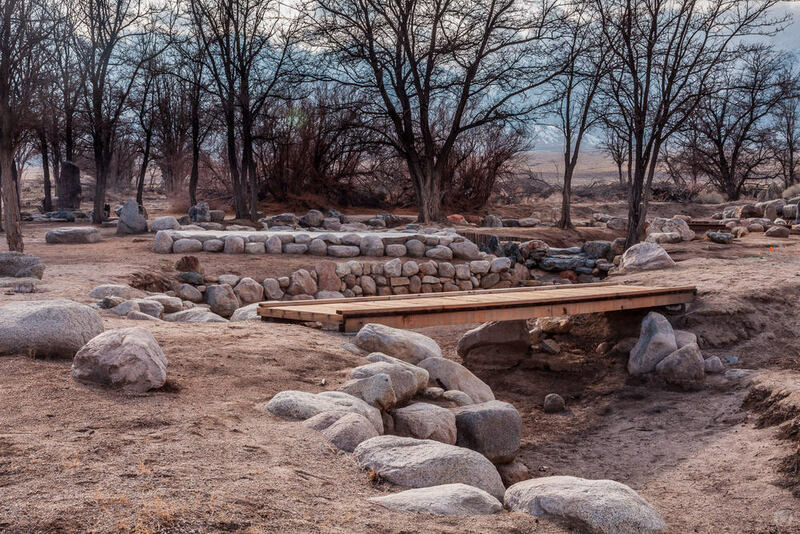 The original stone entry checkpoint buildings were restored. 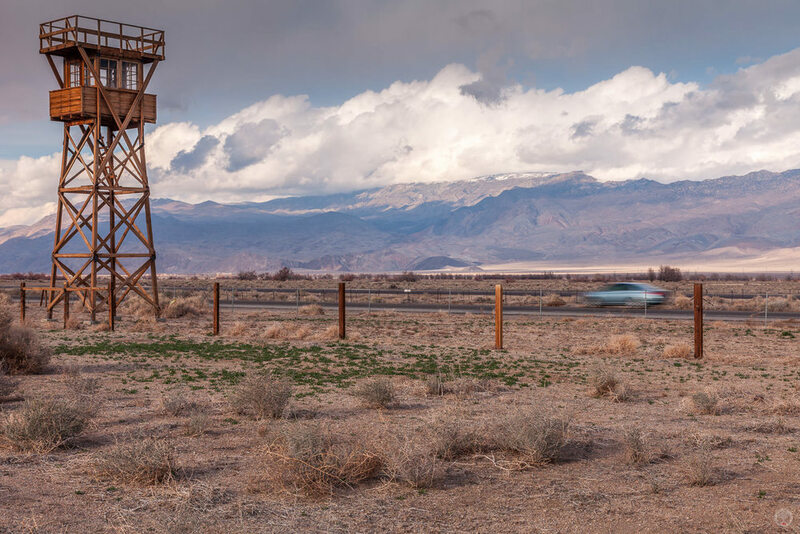 A replica of one of the eight guard towers was erected in 2005. 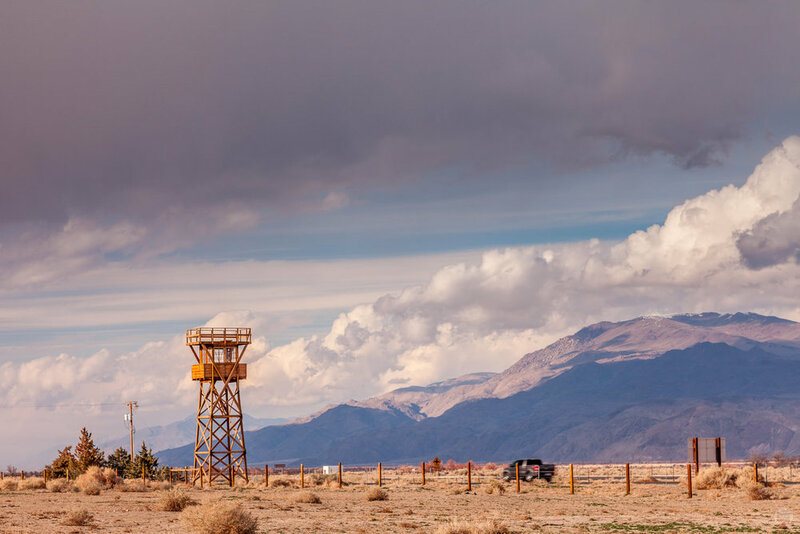 A former mess hall, relocated north to the Bishop Airport after the war, was returned to Manzanar in 2002 and reopened for visitors in late 2010. Earlier in 2010, a groundbreaking was held on one of the 36 blocks within the camp for the reconstruction of two of the former fourteen barracks that would have originally been present during the time of occupation. At the time of my visit in early 2010, the mess hall was not yet open and the barracks not yet reconstructed. Fortunately, the visitor center was open. Originally the multipurpose auditorium located adjacent to the Manzanar school, the building was one of the few that remained after others had been removed. More recently it was rehabilitated by the National Park Service and reopened in 2004 for use as a interpretive center. I found it to be one of the more effective interpretive centers I've ever experienced. In particular, the exhibits do a very good job of telling the stories of a number of former residents. 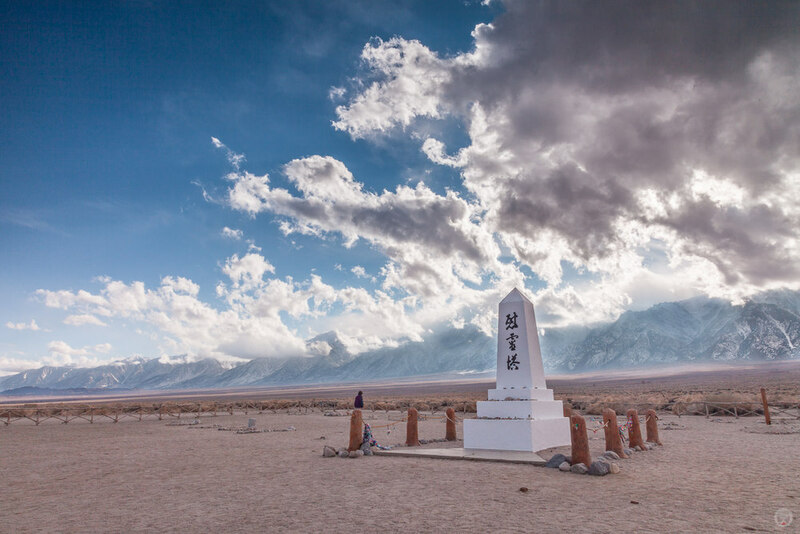 Manzanar is located roughly nine miles north of Lone Pine, California on HWY 395. As you can see on the map below, it is the the main point of interest along HWY 395 between Lone Pine (to the south) and Independence (to the north). Wider ranging directions from more major cities (Las Vegas, Los Angeles, San Francisco, etc.) 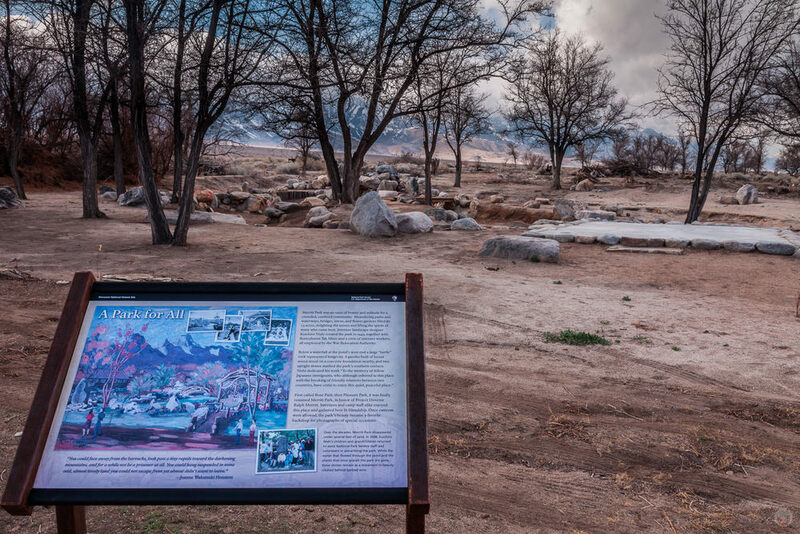 can be found on the National Park Service's Manzanar webpage. That site also notes the latest operating hours, fees, accessibility issues, etc. 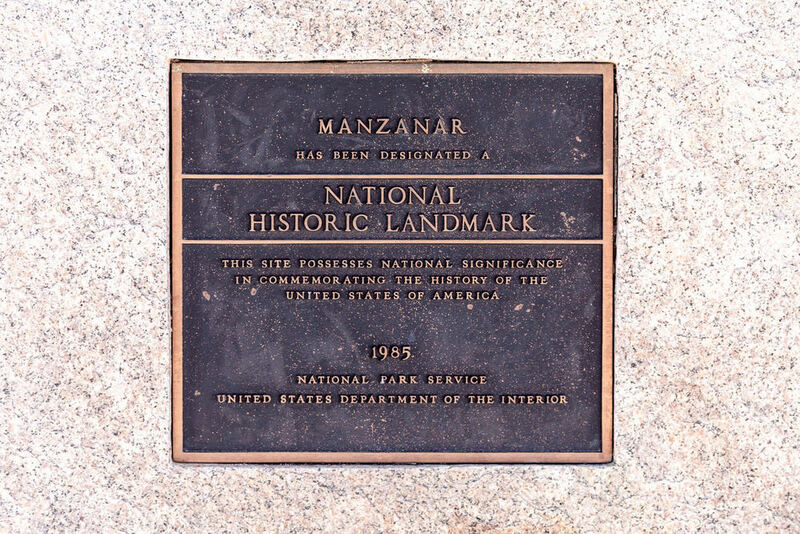 Manzanar was a planned destination even before I bought my plane ticket to Las Vegas. I mentioned that became aware of Manzanar through the work of Ansel Adams. I had read about his involvement, which in turn led me to google to find out where it was and a bit more about its history. Ironically, I had a harder time finding Ansel's photos. In a few short years, that appears to have changed, but back in the latter half of 2009 (before my trip) I turned to my local library. 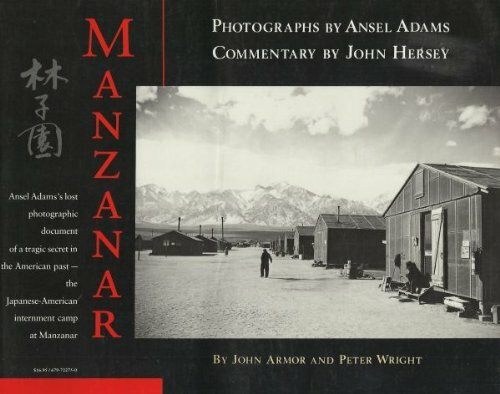 I didn't find much, but I did find the book Manzanar by John Armor & Peter Wright with photographs by Ansel Adams. This title not only showcases Ansel's images, but also puts them into context via thoughtful text. The second book shown below, Photographs Of Mazanar, is similar to the Armor/Wright book, but is much lighter on text. 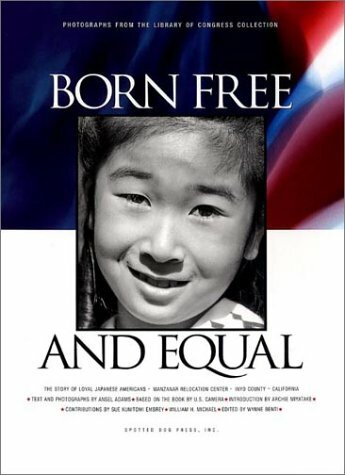 The final title, Born Free and Equal: The Story of Loyal Japanese Americans, is the original publication of Ansel's work. These two titles are not always readily available via online booksellers like amazon.com, but were in plentiful supply at the Manzanar Visitor Center gift shop at the time of my visit.